iNSIDE EUROPE encourages travelers to take the road less traveled and enjoy the festive season iN the Historic Highlights of Germany. If you have not yet been, make sure to visit soon! The Historic Highlights of Germany are 17 beautiful cities across the country with equally stunning Christmas Markets. Each played a major role in German history, some also in European and world history. Quaint old town centers form unique backdrops for traditional one-of-a-kind Christmas Markets. Here is a look at a selection of a few Highlights Christmas Markets, compiled by our 2017 fall intern, Daniela Kammermeier. Marzipan and the Holsten Gate are the first things that come to mind when thinking of Lübeck. The Traditional Christmas Market Lübeck is located in the old town, that is a UNESCO World Heritage site. Marktplatz and Breite Straße are the main locations and the stalls offer decorations, toys and food. The Traditional Christmas Market is not the only market organized in Lübeck. More information about the other event highlights during the holiday season, including an ‘Enchanted Forest’ at St. Mary’s churchyard, can be found here. Potsdam is located close to Germany’s capital city Berlin and is known for its castles, for example, Castle Sanssouci. The city organizes a variety of different Christmas Markets with the Blue Lights Christmas Market being the largest one. Potsdam’s Brandenburgerstraße and Luisenplatz are lit in blue lights which creates a unique ambiance. The Blue Lights Christmas Market offers many events including special shopping nights and activities for the children. The other markets in Potsdam are worth seeing, too. For more information, click here. Christmas Market Trier: Being the oldest city in Germany, founded by the Romans, Trier is a perfect place to travel back in time. 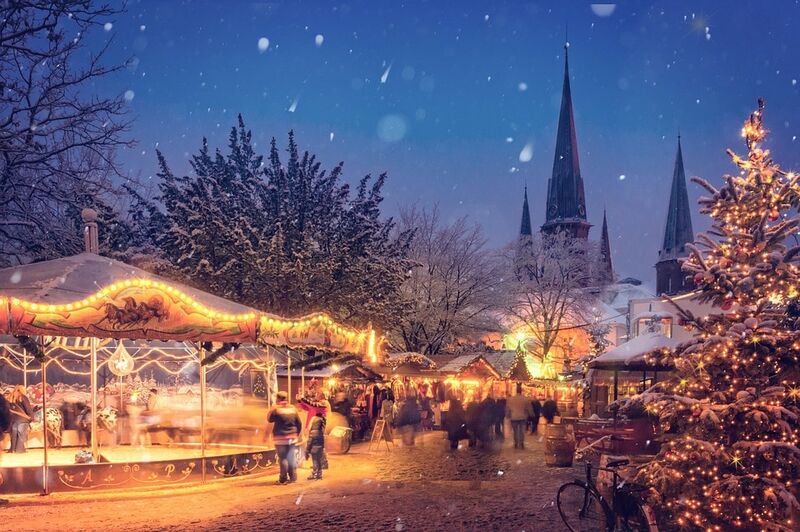 Pre-Christmas, experience Trier Christmas Market on the Marktplatz in the old town. With 95 booths in front of imposing Trier Cathedral, they sell everything from culinary specialties to unique gift articles. Meet Germany’s only Mulled Wine Queen and taste “Original Moselle Vintner Mulled Wine”. A variety of special musical events such as performances by brass bands or gospel choirs keep visitors entertained. Erfurt Christmas Fair: Erfurt is the capital of Thuringiaand datess back more than 1,200 years. Two of Erfurt’s most famous landmarks, St. Mary’s Cathedral and Church of St. Severus serve as the setting for the city’s yearly Christmas Market. Over 200 wooden stalls are set up and around Domplatz, Fischmarkt, and Willy-Brandt-Platz. Sample iconic Thuringian Bratwurst and Erfurt Schittchen, a delicious type of stollen. Another great gift idea is handcrafted local Christmas decorations from the nearby Erzgebirge mountains, a region known for rich Christmas traditions and one-of-a-kind holiday souvenirs. Rostock Christmas Fair: The Hanseatic city of Rostock is the only Historic Highlight city located on the Baltic coast. The Christmas Fair happens on several squares in Rostock’s city center . It is supposed to be the largest in Northern Germany — aside from Berlin or Hamburg — and features numerous attractions that go beyond the average Christmas Market. Wintercarneval with traditional rides including a ferris wheel plus a Fairytale World are additional highlights. There is much more to see and do in the Historic Highlights of Germany: Osnabrück, Münster, Aachen, Bonn, Wiesbaden, Mainz, Koblenz and Freiburg also host beautiful Christmas Markets. Visit the website for Historic Highlights of Germany to learn more. The Bavarian Historic Highlight cities Würzburg, Regensburg and Augsburg are being presented in another iNSIDE EUROPE travel tip.